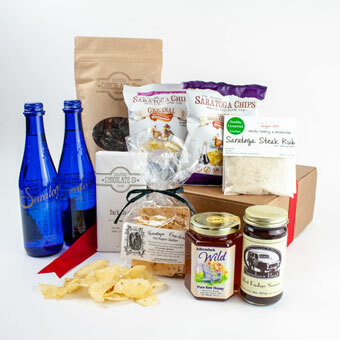 Locals and visitors alike will love this signature Saratoga gift, full of iconic edibles from the Spa City! Open the box and you will find treats to delight lovers of sweet and savory. From The Saratoga Chocolate Company we've included ever popular Raspberry Almond Bark, a delicious blend of dark chocolate studded with raspberries and almonds. Packaged in a hand-stamped, brown paper zipper bag, it makes a beautiful presentation! We've also included a Dark Horse chocolate bar for the dark chocolate purist. Those who prefer a spreadable chocolate will love a generous jar of Sundae's Best Original Hot Fudge Sauce, ready to spread on, well, just about anything! 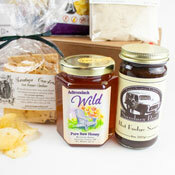 The sweet side of this gift is completed by a jar of Adirondack Wildflower Honey. 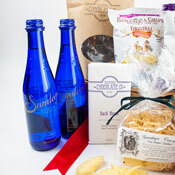 Snackers will appreciate a sampling of world-famous Saratoga potato chips with two single-serve bags included here. A bag of Saratoga crackers, 2 bottles of Saratoga spring water and a Saratoga Steak Rub (because who doesn't appreciate a great steak!) add the finishing touch. Care to choose your flavor of chocolate, crackers, chips or type of water? Give us a call at (518)-450-1130. 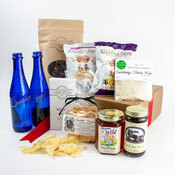 We are happy to customize this gift to suit your tastes or that of the lucky recipient! Saratoga Chocolate Company - Raspberry Almond Bark: A rich, dark chocolate bark studded with raspberries and almonds. Saratoga Chocolate Company - Dark Horse Chocolate Bar: Special reserve dark chocolate bar. Sundae's Best - Hot Fudge Sauce: The cornerstone from a 50+ year old family recipe - grab a spoon and dig in! Saratoga Chips - Original & Balsamic Sea Salt Potato Chips: America's first kettle chip provides a satisfying snack! 2 - 1 ounce bags of chips. Saratoga Crackers - Everything Cracker: Made with Garlic, Onions, and Poppy Seeds, this cracker pairs excellently with soft cheeses and a variety of spreads. Saratoga Spring Water - Sparkling or Still Mineral Water: A Saratoga favorite in the iconic blue bottle. 12 oz. - 2 bottles. Healthy Gourmet Kitchen - Saratoga Steak Rub: Classic spice rub to accompany beef, including horseradish, garlic, pink himalayan salt, shallots and black pepper. Kraft Box, 12" x 10" x 4"